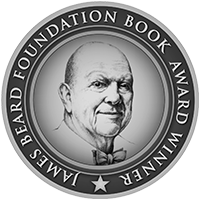 You can also find this recipe in my book, Eat In My Kitchen – To cook, to bake, to eat, and to treat. 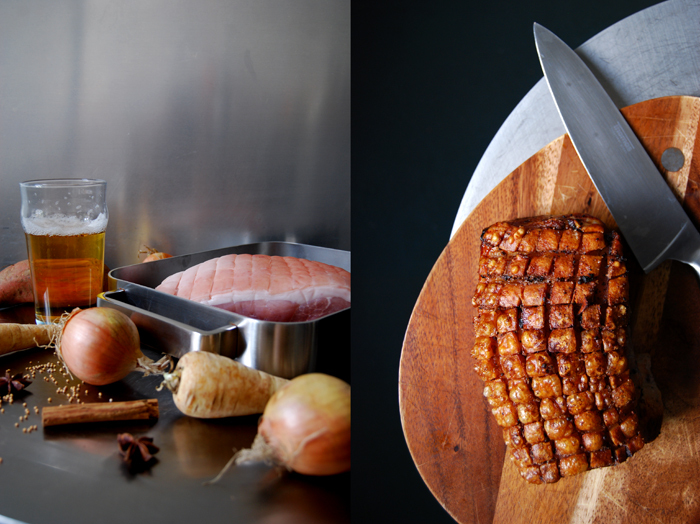 This is the ultimate roast – Bavarian beer roasted pork, also known as Bayerischer Schweinebraten or Krustenbraten. When I visited the Deyerling siblings last week for a meet in your kitchen feature, they reminded me of this traditional roast. 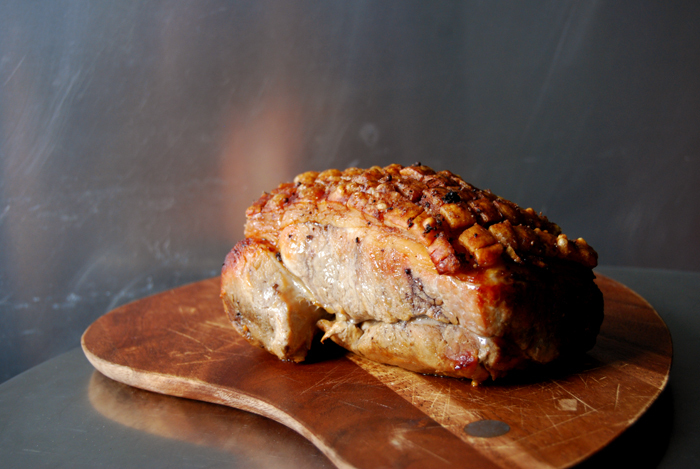 You can’t really ask for more, tender, juicy meat and crunchy crackling on top, perfectly roasted and crispy. This is hearty, honest autumn food, for those cold nights after a long walk out in the countryside. That’s exactly what we did! A few days ago we decided to leave the city for a few hours to visit one of Berlin’s beautiful lakes that you can reach after a short train ride. The Müggelsee lake is my beloved escape whenever I need a break from the buzz. It’s a huge lake, peaceful and quiet surrounded by thick forest. Autumn is just starting to show, so the leaves were still quite green but I could smell the change of the seasons. We have a little tradition, we always stroll down the town’s high street before we go to the lake. We visit the local bakery and butcher, for some cake and bread, sausages and to look for some inspiration. Both of them are traditional businesses, and I have to say that I look forward to checking their daily offer just as much as to walking at the lake. This time we made our choice as soon as we got into the butcher’s shop. 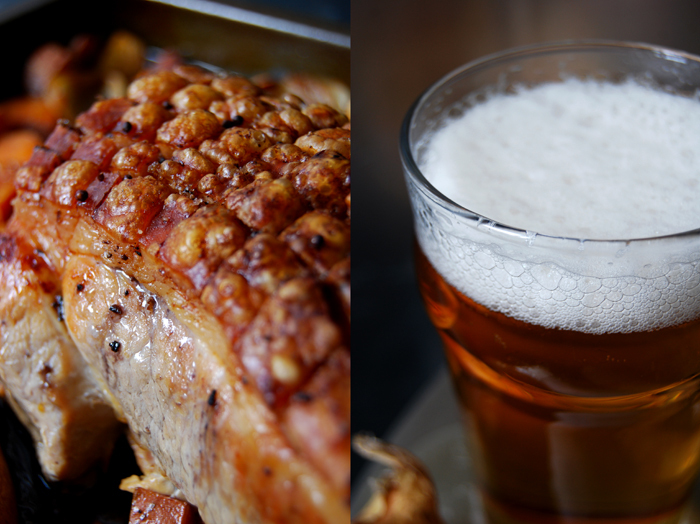 A nice big piece of pork caught our attention and reminded us of the wonderful Bavarian beer roasted pork we cook in winter. The butcher put it aside for us along with a few other delicacies while we continued our walk. On our way back to the train station we picked up our bags and couldn’t wait to get started with our oven roast! 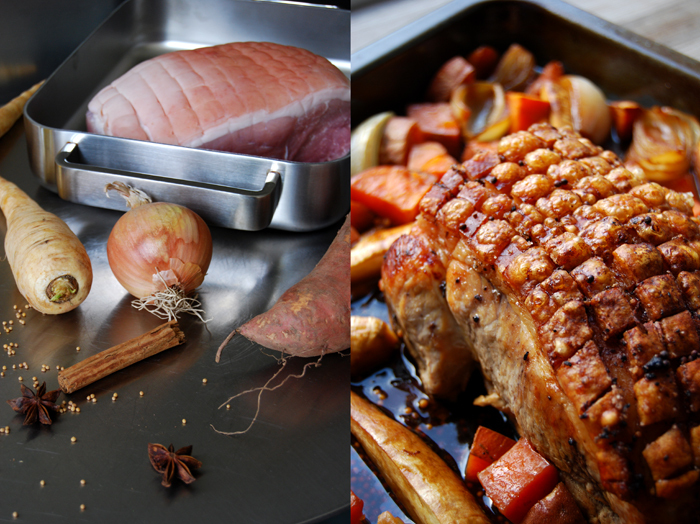 There are various ways to roast pork to achieve the perfect crackling. My mother cooks it skin side down first in a little bit of broth before she turns it around. 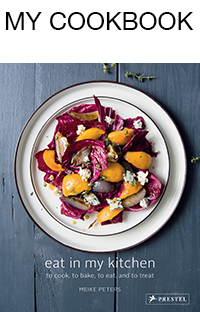 As much as we love to share recipes, here we disagree. I cook mine skin side up without turning the meat. I rub lots of salt and crushed cloves into the scored rind and cook the meat in its own juices for 1 1/2 hours. 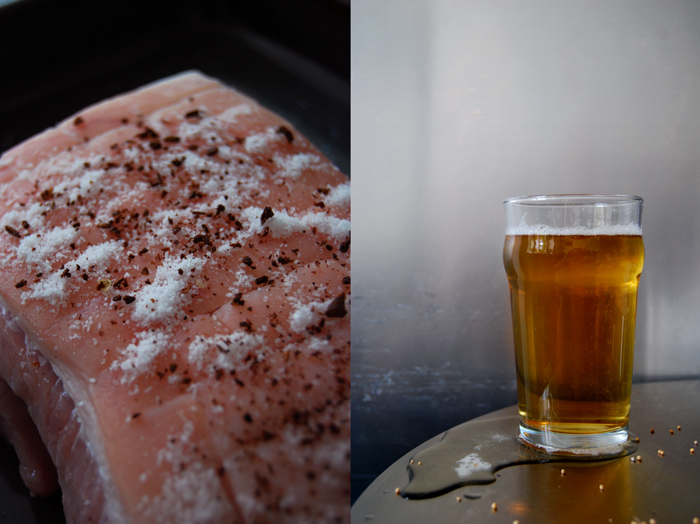 At this point I add the beer and vegetables, cinnamon, star anise and mustard seeds. I chose sweet potato, onion and parsnip to roast in the strong juices until it’s all golden and crisp on the outside and soft inside. I like to season the gravy with some Dijon mustard and fruity jelly, like elderflower or peach, but you could could also use honey or maple syrup. I can’t really say how I prefer this dish, fresh and warm out of the oven with a pint of beer and some potato dumplings on the side or the next day, sliced thinly with some chutney in a sandwich! For this recipe, you need a good sized piece of pork shoulder, smaller pieces tend to dry out, it can be boned or on the bone. I have made this recipe with both. The rind has to be scored in a pattern (as you can see in the pictures). You can ask your butcher to do this or cut the pattern yourself with a sharp knife, just mind that you don’t cut into the meat! If you want to make potato dumplings on the side, the famous Knödel, you can use my Gnocchi dough. You just have to shape walnut sized balls out of the dough and fill each of them with 3 small cubes of white bread. Cook them in lots of salted water for about 10 minutes on medium-low temperature until the dumplings swim on the surface. Set the oven to 175°C / 350°F (I use the Rotitherm setting). 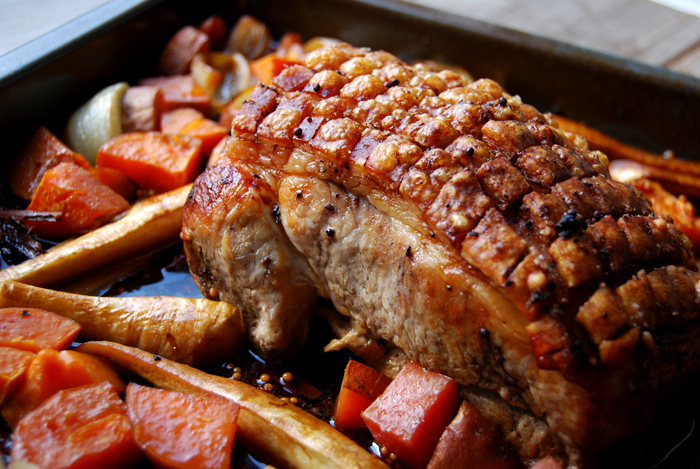 If the rind isn’t crisp enough yet, turn on the grill for a few minutes after you’ve removed the vegetables, gravy and spices and cook the meat until the crackling is light and crispy!